Ea O Ka Aina: Fukushima - What me worry? SUBHEAD: Radioactivity from Fukushima Daiichi disaster is not a health threat in British Columbia. Image above: Man checks radioactivity of mutant on the beach. Detail of photo-art "Radiation" by Ivan Khoenko. Click to enlarge to full image. From (http://howtocarveroastunicorn.blogspot.com/2013/11/plasma-gun-radiation.html). 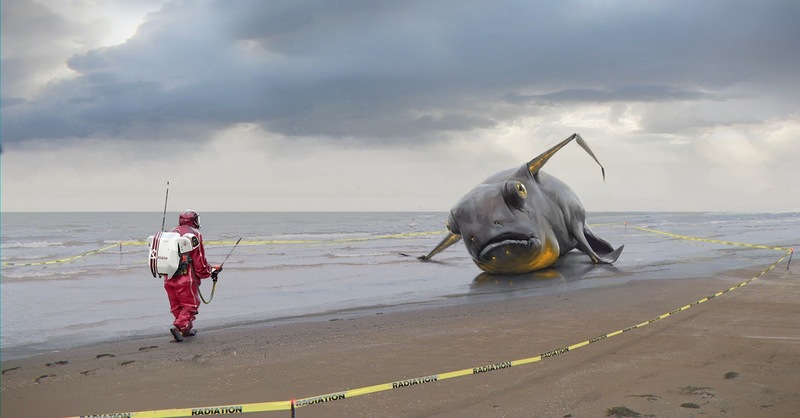 Since the Fukushima Daiichi disaster on March 11, 2011, there are many reports of the potential impact of radioactivity from Fukushima causing harm to sea life and people on the West Coast of North America. But radioactivity from Japan poses no danger and little risk to us on the West Coast. A commonly used unit to measure radioactivity is the Becquerel (Bq for short), which represents an amount of radioactive material where one atom decays per second. When we talk about the radioactivity measured in seawater, the measurements are reported per litre of seawater (Bq/L). Almost all the radioactivity in seawater is the result of naturally occurring radionuclides that have been transported or deposited in the oceans by natural processes. For example, over time radioactive elements in rocks and minerals are delivered to the ocean through the erosion of the continental crust. The average radioactivity of seawater is about 14 Bq/L, of which nine-10ths comes from the naturally occurring elements potassium and rubidium. The remainder is fallout from atmospheric nuclear-weapons testing in the 20th century. So the natural level of radioactivity on average in the oceans is about 13 Bq/L, against which radioactivity resulting from human activities and disasters should always be discussed. The radioactive element Cesium 137 (Cs-137) was released in large quantities from Fukushima into the Pacific. Pre-Fukushima levels of Cs-137 in the North Pacific, present from Cold War-era nuclear testing, represented 0.007 per cent of the natural radioactivity in a litre of seawater. Measurements of Cs-137 were made by an international team of researchers immediately after the disaster in 2011. 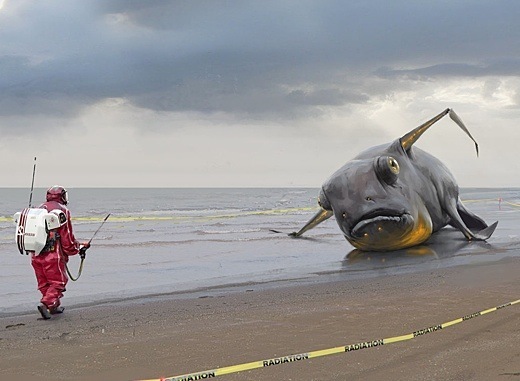 Forty kilometres from the reactor site, Cs-137 was elevated up to 25 per cent of the total naturally occurring background, but fell to two per cent of the background 600 kilometres offshore. Scientists did not have to take any precautions while handling seawater, sediment and biological samples collected during the study because the radioactivity was so low. Talk of plumes of radioactivity being broadcast across the Pacific must take into account that the background radioactivity of seawater is about 14 Bq/L. It is important that although one can detect isotopes from the reactor in the environment, the absolute levels are very low and will be lower as the ocean mixes with distance from Japan and as the isotope decays. A paper in Proceedings of the National Academy of Sciences by Dr. Nicholas Fisher of Stony Brook University and colleagues investigated the risk of Fukushima radiation to those consuming Pacific bluefin tuna. Their findings indicate that the bulk of a radiation dose to human consumers of tuna results from a naturally occurring radionuclide called Polonium-210, which is roughly 600 times greater than Fukushima-derived Cs-137. Indeed, the estimated dose of radioactivity from consuming tuna carrying Fukushima-derived isotopes for a year is similar to or less than our annual doses from air travel, terrestrially produced foods, medical treatment (e.g. X-rays) and other background sources. Release estimates of other potentially harmful isotopes from the damaged Fukushima reactors, some of which can concentrate in the marine food web, are much lower than Cs-137 but must be monitored if the situation changes at the disaster site. We must recognize Fukushima Daiichi for what it is, a disaster resulting from the failure of safeguards at the nuclear power plant. The impact is immense at the site and consequences for the terrestrial environment are dire. There is impact in the ocean as well. For example, bottom-dwelling fish near the reactors are so contaminated that they can’t be sold or consumed and the local effects near and in the reactors are acute and terrible. But when I read that marine organisms and human beings are in danger along the West Coast of North America because of radioactivity from Fukushima, I have a responsibility to communicate to the public that this is not so. The radioactivity that we are exposed to here every day, by being on or in the water or from consuming seafood from the Pacific, is insignificantly different from the time before the terrible events at Fukushima took place. • Jay T. Cullen is an associate professor and a marine chemist at the University of Victoria’s school of earth and ocean sciences. SUBHEAD: Researchers at Oregon State University not worried about radiation effects from Fukushima Daiichi. Video above: KEVI-TV segment on Kathryn Higley trip to Fukushima. From (http://youtu.be/Q_VkylK5FKQ). Researchers at Oregon State University say two and a half years after the Fukushima nuclear spill, they are not seeing any negative effects on the West Coast. Kathryn Higley, a professor and the Department Head of Nuclear Engineering and Radiation Health Physics at Oregon State University says her team has been monitoring the radiation levels not only in Japan but also in Oregon, Washington, Canada, and Australia. “Immediately following the accident, right along the coast of Japan, right next to the plant, there were some elevated concentrations,” Higley said. She says though studies in Japan are continuing to examine the effects on species living at the plant site, she says other species surrounding the plant likely will not be affected. Within the last few years, Higley says the radioactive material Cesium-137 has been seeping into the ocean, but it is chemically similar to sodium. She says once it is in the ocean, it dilutes and diminishes pretty quickly. Even in Japan, she says she is not anticipating any health consequences of the spill. She says workers at the plant had more exposure to the radioactive material, but that their chances of cancer are only a small percentage higher. Thousands of miles across the coast, she expects the same. “On the West Coast, no, there’s not going to be any negative effects,” she said. Though Higley does not believe there will be negative health effects of the spill, she says the Fukushima spill is still an important one to learn from. The research is ongoing. Higley says scientists will continue to test areas in Japan and in areas around the world.